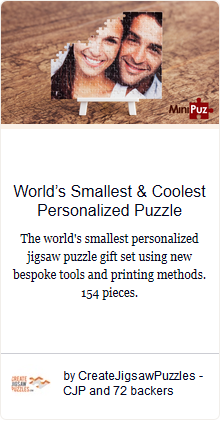 Adding to our collection of puzzle accessories, you can now customize your own puzzle shaped necklace. 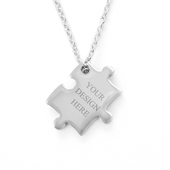 The puzzle necklace makes a great gift as it can be personalized either as a gift for yourself or for friends, family and loved ones. 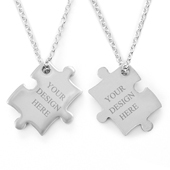 The gift receiver doesn’t have to have a love of puzzles, as this necklace if created as a pair, can become a sentimental and interlinked gift. The puzzle comes in the universal puzzle shape in a silver color along with a silver 18” chain, fitting most people. Pick a small but meaningful quote, a special date, a name or initials or maybe your own designs which will be engraved on to either one side or engraved onto both sides, depending on what you choose. The necklace is made from high quality stainless steel, making it strong and long lasting. The necklace comes in a black velvet bag, making it perfect to gift as soon as you receive it.